Bruce came on around 7:30 with just Roy Bittan on the piano and performed a rare, piano-only, version of “Thunder Road.” That made my night right there. But it only gets better. Next came a sing-along “Hungry Heart” followed by “Sherry Darling,” “Summertime Blues,” and “Girls in Their Summer Clothes.” Bruce called these the “summertime hits,” and they really were as the beautiful summer evening turned to night. 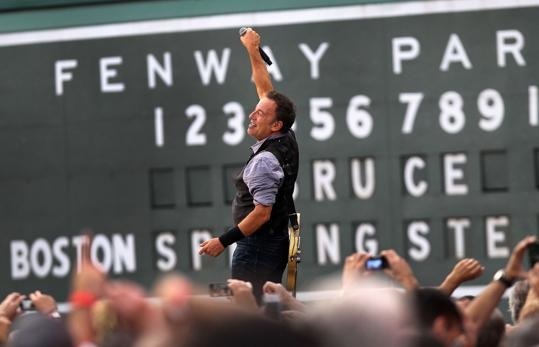 Bruce downed a Fenway Frank and chugged a Beer on stage, all while strumming his acoustic before diving into “Working On The Highway” which led right into “Shackled and Drawn,” my favorite song off the new album. The E Street Band played an amazing “Waiting on a Sunny Day” with vocals by a young fan in the audience. Right in the middle the rain started to come down. Ironic. Next was one of my all-time favorites “Backstreets” followed by “Badlands” then, previously unreleased “Land Of Hope and Dreams.” A powerful trio to say the least. The night was phenomenal to say the least. 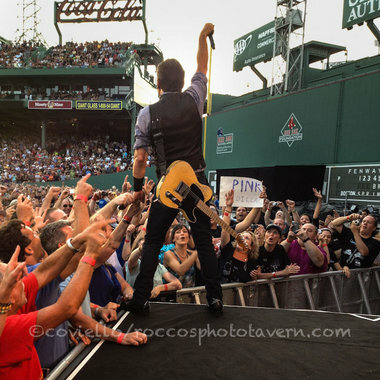 Bruce Springsteen and the E-Street Band put on the best show I’ve ever seen, and I’ve been to a lot of shows. I highly recommend attending a Springsteen concert at least once, whether you are a fan or not. It’s a breathtaking experience. Late Clarence Clemons’ nephew has replaced him on saxophone. The boy has big shoes to fill, but he’s doing a damn fine job, and the band and audience feel the same way.